Sources say the Democratic presidential candidate popped up immediately after the collision and vigorously stomped on home plate while the catcher writhed in the dirt. 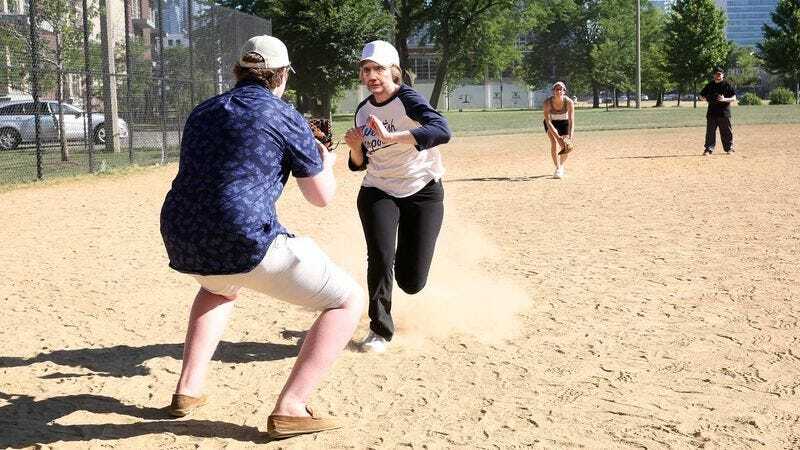 NEW YORK—Refusing to be denied victory by the 22-year-old intern blocking home plate, presumptive Democratic presidential nominee Hillary Clinton bowled over the opposing team’s catcher to score the winning run in her campaign staff’s softball game Sunday, sources confirmed. The afternoon matchup, held between members of the Clinton campaign as a brief break from the grind of the election season, reportedly came to an end in the bottom of the ninth inning when Clinton sprinted down the third-base line and lowered her shoulder into the chest of the young catcher as he attempted to tag her for the final out. Sources confirmed that the violent collision, which sent both tumbling into the dirt as the ball popped loose, sealed an 8-7 victory for the former senator’s side. “The entire time, Secretary Clinton was shouting that he dropped the ball and kept gesturing the ‘safe’ signal,” he added. According to participants, the game-winning play marked the conclusion of what was described as an intense and aggressive performance by Clinton, who reportedly spent most of the game drenched in sweat, covered in dirt, and sporting a bloody lip as a result of diving after a ground ball. In addition to playing with little regard for the safety of herself or those around her, sources confirmed that the former first lady could often be seen taunting opposing players, both verbally and by pointing to the center-field fence before every at-bat. Witnesses also recalled a particularly tense moment midway through the game when Clinton charged from the dugout to angrily confront the game’s lone umpire, political director Amanda Renteria, for ruling a teammate’s outfield hit a foul. According to reports, the presidential candidate then spent approximately five minutes arguing the call as she clenched her crumpled-up baseball cap in her fist before eventually returning to the bench while muttering a string of profanities. Clinton reacted with equal displeasure after striking out in the fifth, when, according to reports, she slammed her bat into the dirt before flinging it against the backstop. “Now that I think about it, she was the only person even wearing cleats,” he added. In addition to clashing with opponents, Clinton frequently directed her frustration toward her own teammates, sources confirmed, often belittling them for fielding errors or poor at-bats. Witnesses said that after chief pollster Joel Benenson bobbled a sharp ground ball hit his way at shortstop, Clinton furiously berated him in front of both teams before ordering him to play right field. Reports also indicated that Clinton refused to allow any of her teammates to pitch, citing her ability to “put some serious spin” on the underhand throws. “I’m just thankful our team didn’t lose,” she added. As of press time, multiple sources who had participated in the postgame handshake line confirmed that the former secretary of state had definitely spit into her palm.